More than 1,700 Dominion customers are without power in south Arlington due to a widespread power outage. The outage was first reported around 2:30 p.m. Numerous traffic signals along Columbia Pike and Glebe Road, including the signal at the busy intersection of the Pike and Glebe, were reported to be dark, though most have since come back online. The outage also briefly caused some issues at the county’s Water Pollution Control Plant along Glebe Road, according to scanner traffic. 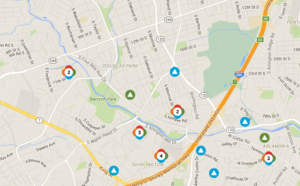 The outage is currently affecting power customers in Fairlington, Shirlington and along portions of the Pike, according to a power outage map and social media reports. More than 100 customers are also said to be without power in Alexandria.